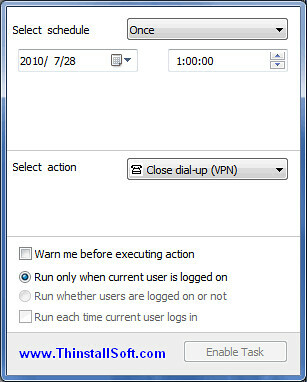 Switch Off is a PC timer utility that could shutdown your PC automatically or remotely from any computer or mobile phone. With Switch Off, you could automatically shutdown, suspend or hibernate your system. This could cut your electricity bills and save the Environment by lowering your PC power consumption. Note: Run SwitchOffPortable.exe to launch Switch Off Portable. The current version is Switch Off Portable 3.4.1.880. Switch Off Portable was updated to version 3.4.1 Build 880 on 2012/12/26. Switch Off could also disconnect dial-up and VPN connections to cut your internet service bills as well. Build-in operation set could be easily extended by adding your own scripts. Automation options allows you to schedule all operations daily, weekly, past specified time or when PC becomes idle. This entry was posted in System Utilities and tagged auto shutdown, schedule builder, schedule maker, shutdown, switch off, vpn. Bookmark the permalink.